The 2009-10 MYEFO, including the historic series, calculates real spending growth using the consumer price index (CPI) as the deflator. Prior to the 2008-09 Budget the non-farm GDP deflator (NFGDP) was used and has therefore been shown in this statement for comparative purposes. The change from using non-farm GDP deflator to the CPI provides a more accurate depiction of government spending growth. So, the change “provides a more accurate depiction” of Rudd Labor’s spending growth, does it? How very convenient, for a government that is borrowing more than a billion dollars a week, that has been under pressure from the Opposition since late 2008 over its massively wasteful “stimulus” spending. There are no prizes for guessing that this “more accurate depiction” effectively reduces the figure for spending growth as a percentage of GDP. The 2009-10 MYEFO, including the historic series, calculates real spending growth using the consumer price index (CPI) as the deflator. Prior to the 2008-09 Budget the non-farm GDP deflator (NFGDP) was used..
Ok. So up to the year 2008-09, the standard methodology was to deflate (ie, reduce) the government spending figure (“Payments”), by a measure called the ‘non-farm GDP deflator’. But in the 2009-10 MYEFO, the government suddenly decided to change this, and start using the consumer price index (CPI) as a deflator instead. Now, I wonder why they’d want to do that? If we look at the spreadsheet, we see that the percentage growth in spending for this year 2009-10, is a lower figure by using the CPI deflator. How much lower? By making this retrospective change in the methodology – in the Mid-Year budget report update, you’ll notice – the government’s spending as a % of GDP can be shown as 26.7 per cent. Only a modest increase on the previous year 2008-09. 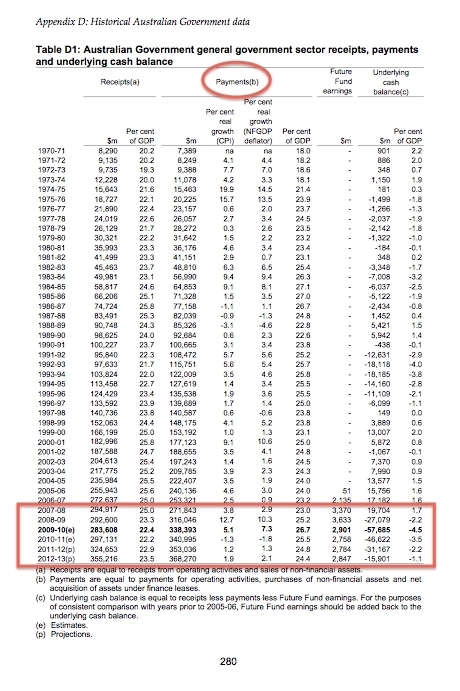 (When you pause to think about this, it is quite implausible that the government could borrow and spend tens of billions in 2009-10 – on foil insulation, pink batts, Julia Gillard-memorial school halls, First Home Owners Boost, etc – but still somehow manage to show in the official budget figures just a small year-on-year %-of-GDP increase in government spending). And in the projections for the next three years, using the new method allows Rudd Labor to show projected growth in government spending that is 8-10% per annum lower than by using the previously standard method. How convenient. That certainly makes Finance Minister Lindsay Tanner’s much-trumpeted promise to keep real spending growth restricted to 2% per annum so much more achievable, doesn’t it? Simply bodgy up the numbers, and hope noone will dig through the maze to find it. Who would ever suspect such behaviour, from a low-rent solicitor and ex-union hack with zero economic qualifications. Rudd Labor have persistently defended their massive spending binge by claiming that our net debt-to-GDP ratio is one of the lowest in the developed world. Of course it is… when you “adjust” the numbers to make a “substantial increase” in nominal GDP, and artificially reduce your spending growth %-of-GDP figure by 30.1%. UPDATE: And this even more relevant episode.